Belgium on Friday promoted Thierry Henry to the number two job with the national side, just days after the Arsenal and France great turned down the manager's job at Bordeaux. The 41-year-old, who helped manager Roberto Martinez steer the Red Devils to third place at the World Cup in Russia, rebuffed the six-time French champions citing “uncertainty” behind the scenes at the club. Henry, the all-time leading goalscorer for both Arsenal and France, takes over from Graeme Jones who left the Belgian set-up to join the staff at second-tier English side West Bromwich Albion. As forwards coach, Henry played a major role in guiding a talented Belgian side to the World Cup semi-final where they were edged out by eventual winners France. “We are delighted that he has decided to stay with the Red Devils, and to stay with what we started in the World Cup in Russia, a very important moment for us,” Martinez told a news conference. 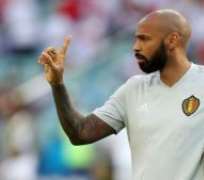 Henry juggled his role with Belgium with extensive TV punditry in Britain, but former Swansea, Wigan and Everton boss Martinez said the Frenchman would now focus on his coaching duties. “We are looking forward to welcome him back, now he is going to have a bigger role in terms of his contribution on a daily basis, because now he is going to full time in the structure of the Belgian federation,” the Spaniard said.